This page provides non-BSC Parties with information about how to introduce a change to the BSC and the Code Subsidiary Documents. The process is different from the Change process which BSC Parties can use. If you are a non-BSC Party (a third party) you can only raise Issues. If you would like to raise a Modification or a Change Proposal you are encouraged to find a BSC Party to raise one on your behalf. Alternatively, you may apply to the BSC Panel (as a Third Party Applicant) to be designated to raise a Modification Proposal. If you are a BSC Party you do not need to be designated to raise a proposal to modify the BSC (a Modification Proposal). These are problems or potential issues with the current arrangements whereby the solution is unknown or undefined, so once raised will be discussed by an industry expert Issue Group to consider possible solutions. These are raised to introduce changes that would alter any part of the BSC legal text. Any CSDs or BSC Systems impacted by the proposed changes would also be updated as part of the Modification. If you are not a BSC Party you are still able to influence the rules outlined in the BSC by submitting a Modification Proposal. To make a change to the BSC you will need to be designated by the BSC Panel to raise a Modification Proposal. We are here to support you through this process and we encourage you to start by contacting ELEXON and discussing the matter with the Change Team. Each designation of a non-BSC Party to raise a Modification Proposal is for one Modification Proposal and cannot be for multiple Modifications or left open for future Proposals. If a non-BSC Party wishes to raise another Modification, they would require another designation. If you are thinking of seeking designation to raise a Modification Proposal, please get in touch with us by emailing bsc.change@elexon.co.uk. Non-BSC Parties will submit applications to ELEXON for validation by completing the three forms, which can be downloaded from the BSCP40 Change Management page, where you can also find guidance on how to complete the forms. Where ELEXON considers the application to be invalid, the reasons will be provided to the applicant. 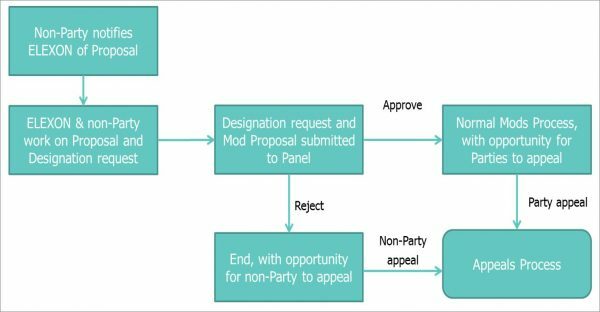 ELEXON will act as a critical friend to non-BSC Parties prior to submissions of their application to increase the likelihood of a successful application. Where a valid application is submitted, ELEXON will prepare a paper for the next available Panel meeting. You will be invited to present you proposed change to the Panel. The Panel will hear from you and will decide whether to accept the Designation request or not. Where your Designation request is approved, the associated Modification Proposal will be raised and progressed in accordance with the standard Modification Procedures and the timetable set by the Panel. Where your Designation request is rejected, ELEXON will notify you and Industry via email, of the decision and the reasons for the Panel’s refusal. You may appeal the Panel’s decision to Ofgem. BSC Parties can appeal the BSC Panel’s decision to designate a non-BSC Party to Ofgem as the Authority.